Quote: Cultures are complicated, and anyone attempting to explain or group them will struggle to avoid giving offense. Political scientists Ronald Inglehart of the University of Michigan and Christian Welzel of Luephana University in Germany put forth their best effort by analyzing data and plotting countries on a "culture map." Their system stems from the World Values Survey (WVS), the largest "non-commercial, cross-national, time series investigation of human beliefs and values ever executed," which dates to 1981 and includes nearly 400,000 respondents from 100 countries. Quote: So what's going on in this chart? In their 2005 book "Modernization, Cultural Change, and Democracy," Inglehart and Welzel argue that "socioeconomic development tends to bring predictable changes in people's worldviews." Notably, these developments tend to democratize countries, and modernization — "a syndrome of social changes linked to industrialization," as the duo define in a 2005 Foreign Policy article — kick-starts the process. But cultural and historical traditions, like Protestantism or communism, matter, too. They "reflect an interaction between driving forces of modernization and the retarding influence of tradition," Inglehart and Welzel write in their book. Another attempt to explain world cultures, the Lewis Model based on observations from linguist Richard Lewis, charts countries in terms of "reactive," "linear-active," and "multi-active" tendencies. This was actually really interesting. Looks like Protestant Europe is the place for me. 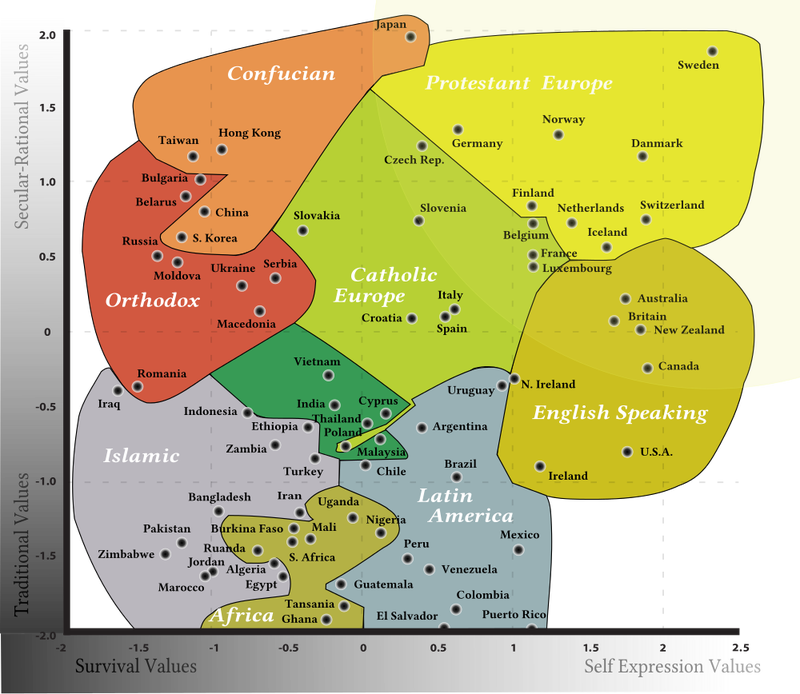 The chart shows Sweden as the world's most advanced society.